Do you charge extra for an English-speaking guide? No. You pay the same price whether we talk in English, Spanish (or Kichwa)! Most people pay in cash on arrival but you can also deposit money into our business account. I’m travelling alone, what can I do? Contact us and tell us when you will be in Tena. Other travellers will probably be taking trips that you can join. Come in sandals and light clothes suitable for walking in the jungle (jeans are not recommended). If you are staying overnight, bring enough clothes for the number of nights you are staying. Swimming clothes and a hat. Insect repellent and plenty of sunscreen. A light or a torch for after dark and your camera (in a plastic bag or dry bag). Bring a small bottle of water (water is provided at the cabins where you can refill your bottle). You’ll sleep in traditional wooden cabins with a wooden bed with mattress and clean linen, a mosquito net and a hammock outside your door. Like any white-water sport, there is always an element of risk. However, you are statistically safer in a raft than your car. Our experienced and qualified guides are trained to minimize risk and have an excellent safety record. Equipment such as helmets, lifejackets and rescue ropes are kept in good condition and regularly checked and there is always a safety kayaker alongside the raft to ensure that you have a safe trip. The most common injury is sunburn. Do I need to have experience to go on a rafting trip? No experience is necessary. However, if it is your first time, and you are a little anxious, you could try a Class III river. Do I need to have experience to go to kayak school or on a kayaking trip? For a Guided Kayaking trip, you will need to have at least basic competence. 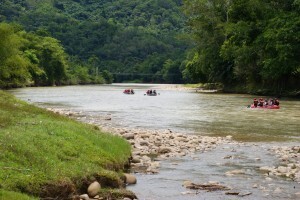 Those who attend Kayak School, usually take a trip on at least a Class II river by the end of their course. Maybe you will, maybe you won’t! It is all part of the fun! But once you’ve fallen in, you’ll probably want to do it again! No, lots of non-swimmers and weak swimmers have had great fun rafting down our rivers. At the safety briefing, your guide will demonstrate how you should lean back on your life jacket and float if you fall in the water. 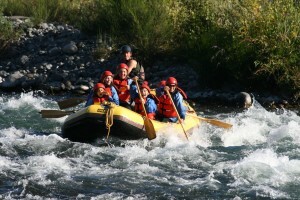 The Safety Kayaker or Rafting Guide will then get you back into the boat. Am I old enough, young enough, fit enough …? Generally, just about anyone in reasonable health and fitness can go rafting. The minimum age is generally 12 years old. There is no maximum age although anyone over 60 should be in good health and perhaps consult with a doctor if there are any concerns. We don’t recommend rafting for those who are pregnant, extremely overweight or have back or heart problems. What should I bring with me on a rafting trip? You’re going to get wet! Come dressed in a swimsuit or shorts and t-shirt and wear sandals you can fasten or light sneakers/trainers. Bring a towel and dry change of clothes for after the trip. You’ll also need your passport number. Your guide will be able to take small belongings in a dry bag and larger items can be left with the driver. Don’t bring anything that you’d be devastated to lose. Your guide will carry a dry bag for small items, but they can never be 100% secure. Waterproof cameras are great and if you have a GoPro, bring it! What do the different ‘Classes’ of river mean? 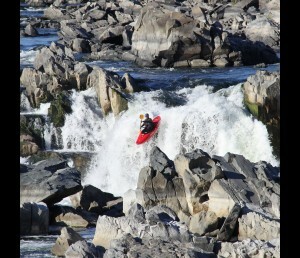 The International Scale of River Difficulty is used to rate the difficulty of rivers for white-water sports. There are six grades which range from Class I (Easy) to Class VI (Very difficult/Extreme). The grade of a river can vary along its length, but it can also change if there has been a lot of rainfall and the water is high.